The Exectuve branch is tasked with implementing legislation. Regulations are the rules developed by government agencies like the EPA or FDA to deal with specific details not included in legislation. Regulations are introduced in the Federal Register, which is published daily, and the public is given a set period of time to comment on the proposed regulations. The final version of the regulation is also published in the Federal Register and then codified (arranged by subject) in the Code of Federal Regulations. HeinOnline includes full text of the Federal Register back to volume 1 (1936). Regulations.gov is your source for U.S. government regulations and related documents. On this site you can find, read and comment on documents. Share your knowledge and make your voice count. Published by the Office of the Federal Register, National Archives and Records Administration (NARA), the Federal Register is the official daily publication for rules, proposed rules, and notices of Federal agencies and organizations, as well as executive orders and other presidential documents. Full text starts in 1994. The Code of Federal Regulations (CFR) annual edition is the codification of the general and permanent rules published in the Federal Register by the departments and agencies of the Federal Government. It is divided into 50 titles that represent broad areas subject to Federal regulation. The 50 subject matter titles contain one or more individual volumes, which are updated once each calendar year, on a staggered basis. The annual update cycle is as follows: titles 1-16 are revised as of January 1; titles 17-27 are revised as of April 1; titles 28-41 are revised as of July 1, and titles 42-50 are revised as of October 1. Each title is divided into chapters, which usually bear the name of the issuing agency. Each chapter is further subdivided into parts that cover specific regulatory areas. Large parts may be subdivided into subparts. 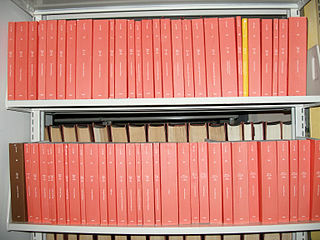 All parts are organized in sections, and most citations to the CFR refer to material at the section level. HeinOnline includes prior years of the Code of Federal Regulations back to 1938. This version, provided by the Cornell Legal Information Institute, links to the GPO version of the Code of Federal Regulations but provides additional help in searching. The codification (arrangement by subject) of all the rules and regulations published by federal agencies. Search or browse the CFR via this web site.